Below is a list of the top downloaded items from the PlayStation Store for the week ending November 12th. This week sees a new top download and that honor goes to Dragon Age: Origins DLC. Also new to the chart is Inferno Pool which makes it’s debut at 20th. 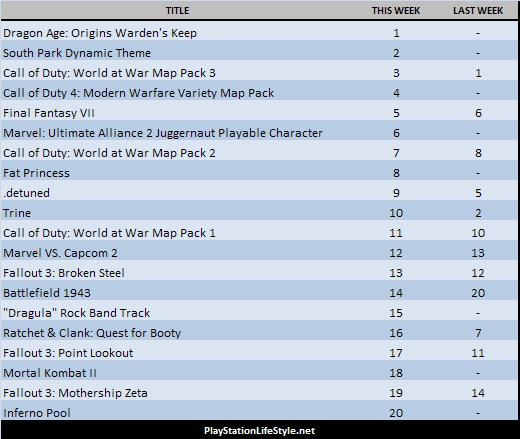 For the first week in a long time Fallout 3 DLC is out of the top 10, though Call of Duty keeps 3 DLC packs in there with the recent release of MW2 certainty helping to push the Call of Duty name. The rest of the top 20 are below.